Make a photo collage online with snowflake photo frame. When one photo is not enough to express your feelings, use Snowflake multi collage to make a perfect Christmas card! You can upload up to 13 photos to get them ‘frozen’ in a snowflake-styled collage. Do you know that a snowflake is a natural wonder that always has only six sides? The snowflake from Funny.Pho.to has 13 photos in it! This snowflake photo frame can help you to add some frosty magic and give a totally new look to your photos! With this Christmas collage template your pics will be placed into a creative collage photo frame in a shape of a delicate snowflake. 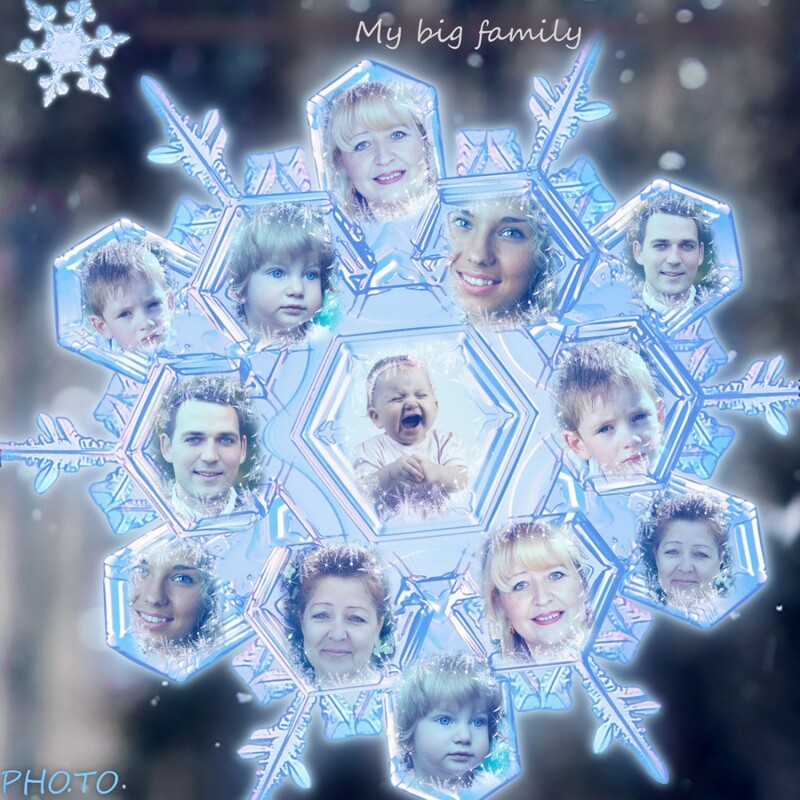 That would be a nice idea to make a snowflake Christmas card with photos of your friends or family members - this extraordinary winter-styled photo collage is a good way to emphasise your family bonds or bonds of friendship. Our Christmas photo collage template has two options: it can handle one photo which will be replicated thirteen times in a snowflake frame, or two to thirteen different photos placed randomly. Use ‘Magic Snowflake’ photo effect to make an unusual winter photo collage in a light blue color theme. Snowflake collage brings a charming frosty pattern to your ecards and can be used together with other winter templates. So we say no more. It's time to upload some photos and make your own frozen miracle!